The lazy days of summer will soon be behind us and we’ll be full force into the crazy back to school season! I don’t know about you, but I’m excited for a change in my routine. Don’t get me wrong – summer is great but I’m looking forward to the fresh start of a new school year. I know that back to school is stressful and hectic, but it doesn’t have to be. With a few small tweaks to your routine, you can be organized and prepared for all the upcoming changes. I used to procrastinate and wait till the very last second to get ready. Thankfully, I’ve changed my ways and adopted a few tips and tricks so that this busy season is much more enjoyable. Try these simple changes and get organized for back to school today! 1. Don’t wait until the night before to start planning. Go grab a pen and paper or your favourite mobile app and make a list of everything you are going to need to buy for your kids. Many schools will post on their website a list of supplies required for each grade level. You’ll need it to know what exactly you need to buy. The earlier you can do this, the better off you’ll be. 2. Look through flyers to find the best deals. You can also do this from a flyer app on your smartphone. Figure out what stores you need to visit to get everything you need on your list. If your local store price matches, you can do one-stop-shopping and get everything you need in one swoop. 3. Look around your home for items you may already have. I check my kids’ backpacks because they’ll usually bring home unused school supplies from the previous year. It’s great to be able to use them for the upcoming year and you can save a little bit of money, too. 4. Shop with convenience and security. I love using Interac Flash® to pay for my purchases. It’s convenient, fast and secure. I simply hover and hold my Interac Flash enabled debit card over the payment terminal and within seconds, my purchase is complete. It’s nice to not have to be able to dig around in my purse for exact change or enter my PIN to finish buying my kids’ school supplies. I use it all the time to pay. In fact, I don’t even carry cash anymore! Give it a try and you’ll see what I mean. 5. 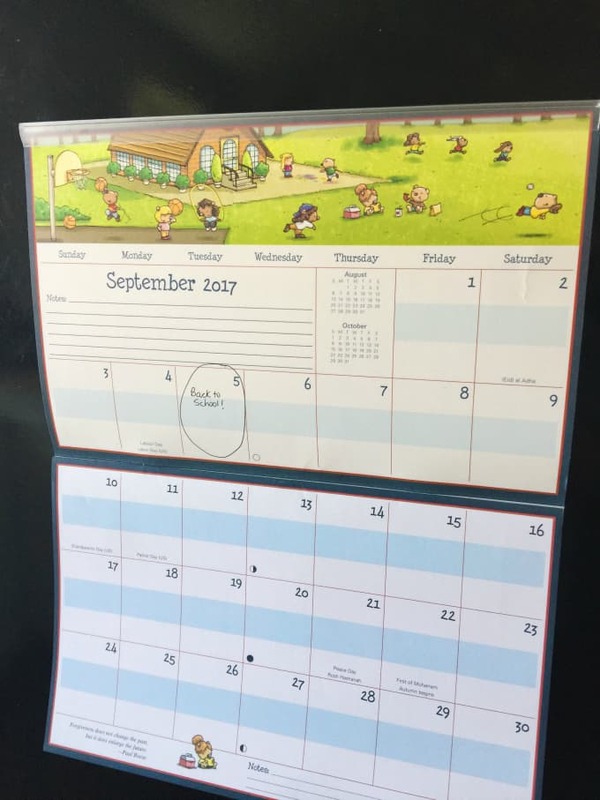 Keep a calendar on your fridge to keep track of schedules. I’d be so lost without because my daughter seems to have something going on almost every night. She takes horseback riding lessons a few times a week. Plus, there are appointments, birthday parties and more to figure out. You’ll always know what is happening in the coming days and weeks. Never forget an important date again. 6. Designate an area of your home for homework. I call it the “Homework Station”. It doesn’t need to be fancy. It can be a desk in your den or your kitchen table. Keep a few key school supplies close by so your kids can have everything they need when they sit down to work. As you can see, with a few small changes to your everyday routine, you can get organized for back to school in no time at all. Save yourself some stress (and money!) and try these tips today! What are some of the ways you get organized for back to school? Interact Flash sounds fast and convenient. I am always busy and usually I am running in and out of stores pretty fast so I love to save time wherever I can. Our school started a few weeks ago already and I will have to say I am NO WHERE near organized! This will give me a focus! Better late than never right!? I love these tips! The school year can get so hectic, especially for the first few weeks. I’m going to give some of these ideas a try. These are great tips! Number three is my favorite. It’s so easy to forget what you still have around the house, especially if you stocked up on sales at the end of the previous season. Definitely shop your own house first. I don’t think I could survive without a calendar once school starts. Life gets so crazy and your tips are going to totally come in handy to help keep us sane! Getting back into the flow of things can be a real challenge. This is good advice! I think establishing a homework station will help a lot. I need to dedicate a space in my home for a homework station. After all, I will have three in school now! 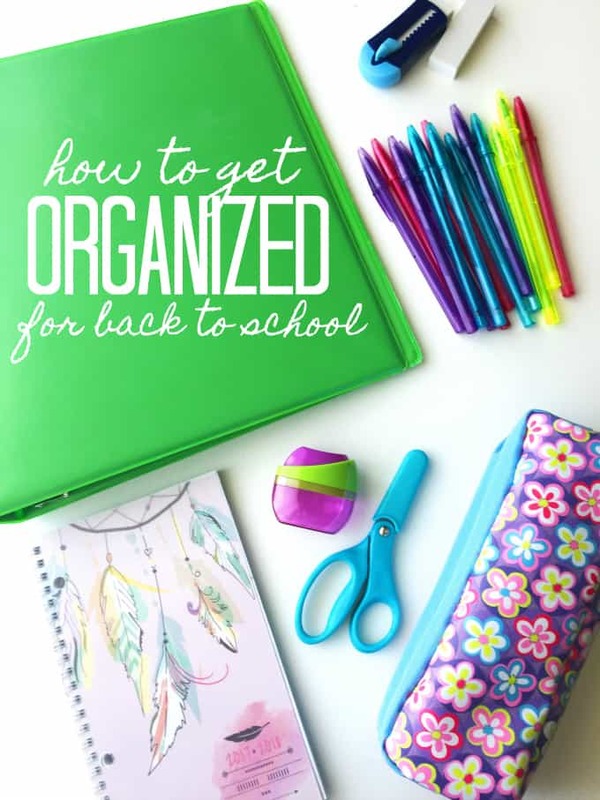 These are some great tips to get organized for back to school. We just bought paper and got home and found we already had a pack..
We have been working on getting ready for back to school. I have a few baskets set up to put all the supplies in. I think it is important to get back into the routine about a week before school starts. I think these are great ways to stay organized. I love using a calendar to keep things organized for school. I’m always using them to write down things, and having our school calendars are a great help too. Great tips! We’re back in school and you are so right being organized is the way to go. The only way to survive! We started school three weeks and I can’t believe we pulled it together in the nick of time. I am still trying to figure out our system so I will use your tips! I love these tips! Thanks for sharing! I need these tips to get back on track for school routines. You’ve got great tips but there’s 2 that I really like, 1. Look through flyers to find the best deals and 2. Look around your home for items you may already have because you should try to save wherever you can. I pretty much do everything that you have listed (p.s I have the same calendar LOVE IT) The only thing we slacked on this year was clothes shopping! we are actually going tomorrow but usually I am a head of the game and get things at the beginning of the month. I, thankfully, no longer have to worry about back to school time that makes back to school time completely stress free. I do remember there being a lot of good sales on at this time of year though, I always took advantage of those, saved no end of money. Some great tips, one thing I find is to be careful how much you buy. Yes get the essentials but some of the others items what to see whether or not they are really needed. There are so many cute items out there but often they don’t get used or are not needed. I need all the help I can get with being organized! Keeping organized is always good! This is a great article about going back to school. Very informative for Parents.